Every year, Edge.org poses one particular question to about 200 thinkers. All the answers are posted on the website, and eventually published in book form. The 2016 question was: "What do you consider the most interesting recent (scientific) news? What makes it important?" The question of whether extrasolar life (and extrasolar complex life in particular) exists is arguably one of the most intriguing questions in science today. While we don't know with any certainty whether the emergence of life on an extrasolar planet requires conditions similar to those on Earth, the presence of liquid water on a rocky surface is thought to be a generic necessity for the life-producing chemistry to be able to operate. This assumption has led to the concept of a Habitable Zone (HZ) -- that "Goldilocks" not-too-hot not-too-cold region around a star, where the temperature and atmospheric pressure allow for liquid water to exist on the planet's surface. The idea of the HZ has, in turn, brought the question of "How many Earth-size planets in the HZ exist in our Milky Way galaxy? to center stage. Amazingly, during the past few years, observations (primarily by the Kepler Space Observatory) have accumulated sufficient statistics to solve this piece of the puzzle. Even the conservative estimates published in 2014 put the number of roughly-Earth-size planets orbiting Sun-like (or smaller) stars in the HZ (in the Milky Way) at about 10 billion! (Figure 1 shows a few of the Earth-size planets in the HZ of their host stars). Figure 1. 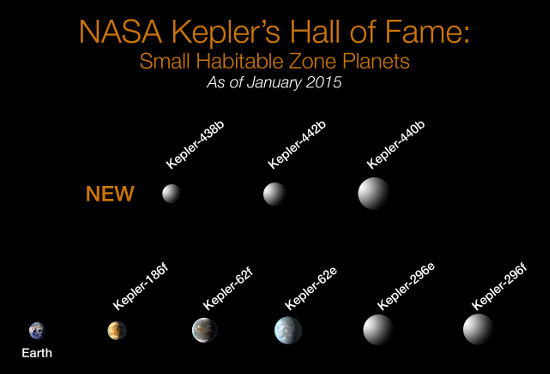 Roughly Earth-size planets in the Habitable Zone of their central star. Credit: NASA Ames/W. Stenzel. The publication of this empirically-based estimate marked a critical point at which the quest for extrasolar life transitioned from mere speculation to an actual science. The realization that planets which could, in principle at least, support life has turned the search for extrasolar life almost into an obsession for many astronomers. The plans for the near future in this field envision a two-pronged attack. On one hand, a series of upcoming and planned telescopes (in space and on the ground) will look for biosignatures -- characteristics imprinted by life processes -- in the atmospheres of planets in the HZ of their host stars. On the other, Russian billionaire Yuri Milner announced on July 20th, 2015 a $100-million decadal project (called "Breakthrough Listen") aimed at providing the most comprehensive search for alien communication (an extension of the existing Search for Extraterrestrial Intelligence) to date. There is little doubt that the determination of the number of planets capable of hosting life will stay news for at least a few decades. The only discovery in this domain that will eclipse these findings will be the actual detection of extrasolar life. We are, for the first time in human history, on the verge of potentially eliminating the last obstacle to Copernican modesty -- life on Earth. Copernicus taught us that the Earth is not in a special place in the solar system. Since then, we have discovered that neither our place in the galaxy nor our galaxy itself is special. Darwin has further shown that humans are a natural product of evolution by means of natural selection. The discovery of extrasolar life will demonstrate that even that last claim to being special will have to be abandoned.